Please fill out the Dentist registration form and we will get back to you shortly. I am an associate and want to volunteer at another participating office. Is that possible? Yes, please use the contact us button to email us and we will try to pair you with a local office. 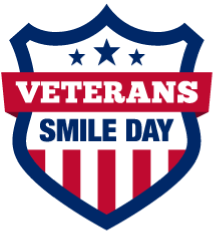 Yes, but please use the Veterans Smile Day name and logo for all your materials. We may or not be able to send you supplies from Henry Schein. Can I treat family members of Veterans? Yes, you can treat whoever you like, but please focus on our Veterans. Do I have to do everything for the Veteran? No, you are free to treat however you feel comfortable. Any service provided is better than no service. Try to recruit specialist to help you also. Yes, we are a nonprofit 501 (c)(3) organization. Please contact us for more information. What if there is not dentist close to me? Sorry, we are trying to recruit as many dentists nationwide as possible. You may have to drive a long distance to seek treatment. I am in pain, can I be seen? Most likely yes, it depends on the services the dentist you are going to is providing. Do I need to show proof of being a veteran? Yes, please bring your DD214, Retired Miltiary ID, or some veterans ID card. No, all services provided will be FREE for all veterans. Follow-up services such as crowns or dentures may have a fee. Can I get all my work needed done? Most likely no. Since there are usually a lot of veterans in need, we try to take care of the most urgent needs. However, it is ultimately up to the discretion of the dentist. I dont have a regular dentist. Can I stay with one of these participating dentist? Most likely yes. Please ask the dentist is they are accepting new patients.